The first-ever Sharkie award, plus honors for best feature story, best writing on deadline, best videography, best video editing, best photo slideshow and more, were announced Friday at Newsroom by the Bay’s 2011 multimedia showcase. Judges Tyler Brown, summer editor-in-chief of The Stanford Daily; Dan Stober, director of the Stanford News Bureau; Adam Gorlick, social sciences writer for the Stanford News Bureau; and Jessie Garnier, senior web developer for Stanford’s Department of Bioengineering, reviewed four news websites for which NBTB students spent a week creating stories, photos and videos. Program co-directors Beatrice Motamedi and Paul Kandell also participated in the judging. Students worked over a span of five days, from 3 p.m. on Sunday, June 26 to midnight on Thursday, June 30, to create a variety of stories, photos and videos for the Advance, Breeze, Courier and Sentinel websites. In addition to instructors Ellen Austin, Michelle Balmeo and Tracy Sena, team leaders Christine Chang, Rye Druzin, Scott Landis and Erika Rae Langdon worked closely with students in teams of 15 to produce, edit and post content. One site, the Advance, posted 50 products (stories, photos and/or galleries, video) in fewer than five days. “We had such a fabulous staff — committed to journalism, and with tremendous expertise,” said C0-Director Paul Kandell. The first-ever Sharkie award will go to Teagan Sebba, who received news during camp that her iReport on newsman Anderson Cooper will be shown on CNN. The Sharkie is given to the student who most captures the essence of the newsroom — someone who moves constantly, is driven by curiosity, dives into work and won’t let go until the story is finished. Sebba, 16, hails from Fort Collins, Colo., and will be a high school junior next year. 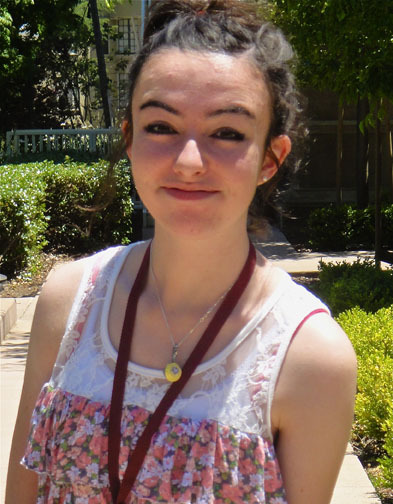 “I love every aspect of journalism,” Sebba wrote in her application essay for NBTB 2011. “I love the excitement of covering a story, the editing, the formatting, the final product that is out there so the world can stay informed, and the emotion. At NBTB this summer, Sebba took her interest a step further, traveling far from home to pursue her passion. “I love airports. I love planes. I love California. I love Stanford. I love journalism. I love people who love journalism,” Sebba wrote in her “TeaganTalk” blog on the Breeze website. What a great experience for these kids…….thank you! My daughter thoroughly enjoyed her time there! Hoping to hear there is a second year program! Teagan had absolutely nothing but wonderful things to say about her time at Newsroom by the Bay! Thank you for all your hard work!